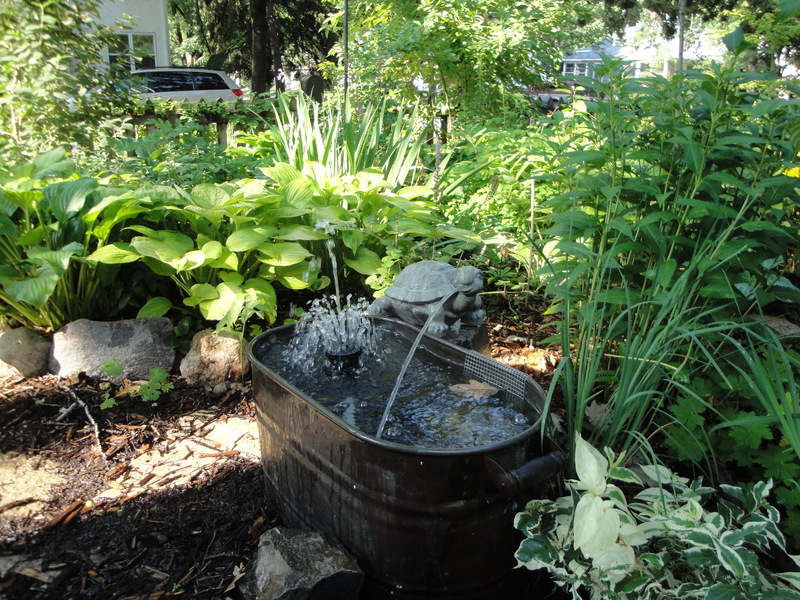 A small stock tank becomes a water feature with the addition of a whimsical fountain. This past weekend, I had a chance to visit about a dozen gardens on three tours: the Hennepin County Master Gardeners Learning Tour, the Red Wing Arts Association tour, and the Northfield Garden Club annual tour. One point struck me strongly at all three tours: Gardens are not just visual. We experience them with all our senses: sight, sound, touch, smell — and, if you grow edibles, taste. To be truly comfortable and evocative, a garden must include sounds, smells and textures as well as pretty colors and dramatic design. I wrote about Meleah Maynard’s garden over on the new Notes from Northern Gardener blog from MSHS. What I noticed when I first entered this urban space was the sound of water and the tweeting of birds. Meleah and her husband, Mike Hoium, have created a shady refuge with many small water features: tubs with fountains in them, bird baths, bubbling urns. The sound of the water is soothing and its presence attracts birds to the yard. 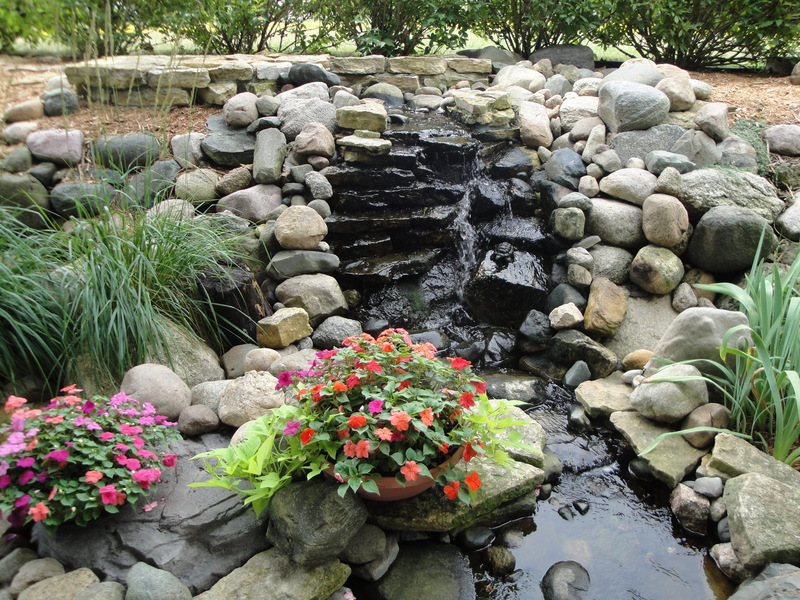 This waterfall in a Northfield garden added sound and a soothing feeling to the space. All of the gardens I visited had some type of water feature: a fountain, a pond, a small waterfall, a bubbler. Some were formal looking, others informal or even whimsical, all brought an extra dimension to the garden. The Red Wing tour was even more fun because of the addition of musicians in the garden — I loved these accordion players! 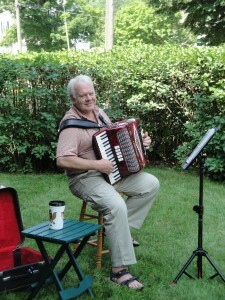 What a great garden tour idea — musicians! Water and sound are wonderful, but scent makes a garden even more memorable. Fragrant lilies, herbs, other plants that smell sweet, pungent, sharp or even a little stinky give a garden another layer of experience for visitors. Terry Yockey, whose garden was on the Red Wing tour, has an entire section of her large garden devoted to scent. I left her place with a pocketful of leaves from herbs, shrubs and perennials — each with a different smell. Some acrid, some sweet, some pungent, some floral—each scent creates a mood in the garden. Long ago, I read that scent, unlike sound or sight, produces the strongest memories in humans. I believe that’s true based on how certain suntan lotions bring back recollections of long ago trips to the beach. Make your garden more memorable with scent. How do you add sound and scent to your garden?